Legacy Library: Thomas Lynch, Jr.
ThomasLynchJr is a Legacy Library. Legacy libraries are the personal libraries of famous readers, entered by LibraryThing members from the Legacy Libraries group. » Thomas Lynch, Jr.'s catalog. » Thomas Lynch, Jr.'s legacy profile. ThomasLynchJr is also an author. About meThomas Lynch, Jr., (5 August 1749 - 1779), South Carolina statesman and signer of the Declaration of Independence. The son of Thomas Lynch and Elizabeth Allston, Thomas Jr. was born at his father's Hopsewee plantation on the Santee River. 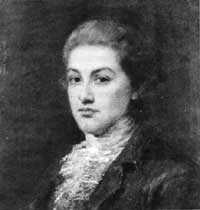 He was educated briefly in South Carolina, but was enrolled at Eton on 9 June 1764. He matriculated at the Middle Temple on 6 March 1767, and at Gonville and Caius College, Cambridge, on 18 May 1767 (he's not believed to have attended the latter, but was the only signer with this type of classical English education). Lynch returned to South Carolina in late 1771, and the following May married Betsy Shubrick. They set up house at Peachtree plantation, near Hopsewee, and Lynch began to take an active role in political matters (as his father had done). Lynch was a member of the July 1774 convention condemning the Boston Port Bill, and later that year was elected to succeeding sessions of the provincial congress. He was commissioned a captain in South Carolina's First Regiment on 17 June 1775, and served with the regiment through early 1776. Having been named a delegate to the Continental Congress, Lynch arrived at Philadelphia in late April 1776. His father was also a delegate at that time (the only instance of a father and son simultaneously sitting in that body). He was present for the passage of Lee's independence resolution and the approval of the Declaration of Independence, which he signed on 2 August 1776 (his father could have signed, but was too ill to attend additional sessions of the congress). Lynch continued to serve in Congress until 30 October 1776, but after that, also being in poor health, he and his father began the return trip to South Carolina. Lynch Sr. died along the way, at Annapolis. The younger Thomas refused reelection to Congress, and his health remained poor. Lynch and his wife left Charleston on 17 December 1779, bound for southern France via St. Eustatius (in an attempt to cure his long illness). Their ship, the brigatine Polly, was lost at sea. Lynch was survived by his three sisters: Sabina (married first William Cattell, second John Bowman - 4 children); Esther (d. unmarried, 1825); and a stepsister Elizabeth (married first John Harleston, Jr.; second Maj. James Hamilton - 3 children). About my libraryLynch's library is mostly known from his estate inventory, filed in the Charleston, South Carolina courthouse. This includes titles amounting to 109 volumes, valued at £24, 18 shillings, 8 pence. Several other titles known to have been Lynch's were not included in the inventory, but are captured in Joseph E. Fields, "A Signer and His Signatures: or, The Library of Thomas Lynch, Jr." Harvard Library Bulletin, Spring 1960, pp. 210-252. At Lynch's death, his library was divided among his three sisters, and it is through descendants of the two married sisters (Sabina Bowman and Elizabeth Hamilton) that the books (or pieces of them) have passed down. Lynch's nieces and nephews (and their children) happily provided clipped signatures from the known Lynch books as early as the 1830s. At least some of the books were donated to the Apprentices' Library Society in Charleston, and signatures from these were pillaged by autograph hunters in later decades (with the apparent permission of the librarian!). This process is expertly dissected in Fields' article.